If you were to choose a day for Scotland to become independent, what would it be? How about 1st January of the earliest year possible after the referendum, say 2016? What better day could there be? Hogmanay has become the Scottish annual celebration par excellence, known throughout the world. In the depths of winter it is heavy with symbolism. Traditionally, the back door is opened to let out the old year, the front door to usher in the new. The first visitor over the threshold brings gifts bestowing good fortune on the household for the new year – coal, shortbread, salt, black bun and whisky. 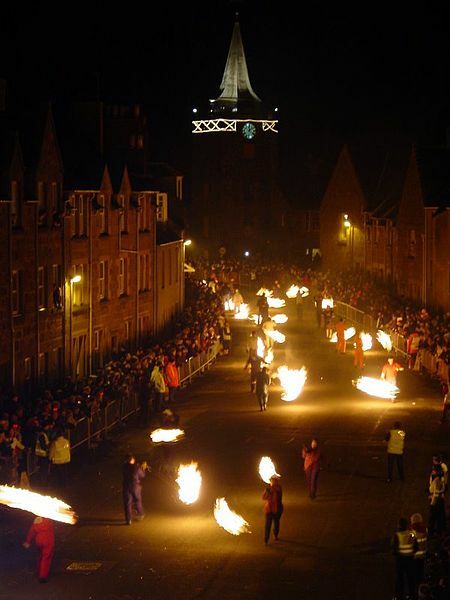 Down the road in Stonehaven from where I live there’s even a spectacular Hogmanay fireball ceremony to help drive winter away and encourage the life-giving sun to come again, that and the chance to sink a dram or two. So, new year, new nation. What could be better? Not if the SNP has its way. Press leaks over the weekend suggest that their forthcoming independence referendum white paper will propose a different date. This date, famed throughout the world like Hogmanay (not), is the day our forward-looking government has chosen for a symbolic new start that will reap all the promises of the future, if we only vote Yes in the referendum. Why 24th March? Well, Scots may (may) know. No-one else will. It’s the date the Crowns of Scotland and England were united. In 1603. So trapped in the past is this political party that they choose a date that looks backward 413 years. But never mind. On current SNP plans Scotland will still keep the English pound sterling. And the English monarch. Confused? I am. That’s why I put independence in inverted commas in the title to this post. Perhaps next week’s Scottish government white paper will allay my concerns. It’s apparently 670 pages long. Now that’s what I call an easy read. Thank you for the e-mail asking me to connect with you on LinkedIn. You didn’t include a personal message with your request so I’m not quite sure why you want to add me to your network. I remember you left the council I worked for in, was it 2008? Crikey, that’s five years ago and I haven’t heard from you until now. You’ve gone on to greater things since then, the parliamentary seat, party spokesperson on (let me be coy) Topic Y, probably much more I’ve not noticed. Good for you. All that stuff in the council must have been helpful – the single-minded pursuit of your own area of responsibility, the loyal support of officers who promoted your agenda and, let’s be frank, the war of attrition with your party colleagues. As for me, I took a voluntary package to leave – no hard feelings, it was time for a change – and as my LinkedIn profile says I’ve morphed into a creative writing student. Well, between studies at the moment, but with one or two pieces published, like my story in the New Writing Scotland anthology, although I don’t expect that’s your sort of thing. Truth is, apart from the creative writing, I’m sort of retired as far as paid work’s concerned. So I’m not quite sure what sort of business it is we might do together through LinkedIn, unless you’re looking for some creative writing to support your political activities, heaven forfend. I noticed, perhaps you did too, that I live in the area you represent in parliament, so the only other thing I have that might be of interest to you is … no, it couldn’t be, I was going to say an occasional vote.